The first major ranked team showdown of the season has incredibly high stakes. Both teams are late in a rebuild process that saw them sink from the top of the sport to some pretty ugly lows. The winner will have a nice signature win to start the season and will have momentum heading into what will be a crucial conference season for both. A loss, as long as it isn't a bad one, won't be fatal, but it will really hurt whatever national title dreams they may legitimately have. Games don't get much bigger than this in September. And speaking of big, the game will be played in Arlington in the NFL's biggest facility, AT&T Stadium. Size won't matter to these teams, though - both squads play in bigger stadiums at home. Florida needs to hope that they will still have players available to play by game time. They suspended two more players on Wednesday, bringing the total unavailable for this game to 10. Only star receiver Antonio Callaway is a major loss, but the distraction of this situation surely hasn't helped their focus heading into a game that they can't afford to lose. Callaway's absence will be a blow for whichever QB ends up playing most. There was a three-way battle at the position between grad transfer Malik Zaire, Luke Del Rio and Feleipe Franks. Franks, a redshirt freshman, was named the starter on Wednesday, but he's all but certain not to be the only guy to see time on Saturday. Whether Franks keeps the job or not, though, it won't be hard for the team to get solidly better play at the position than they had last year. The QB uncertainty and the loss of Calloway represent a lost opportunity for the Gators, though. Michigan is starting two new corners, and the very impressive Jourdan Lewis is now with the Cowboys, so a strong passing team could have likely done some early damage. A big focus for Florida will be to get their strong defensive front seven working early. 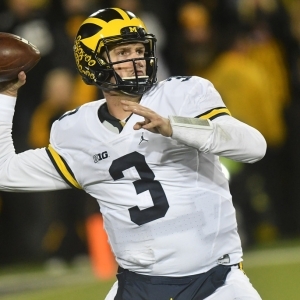 The Wolverines have technically not named a starting QB, either, but it would be a real surprise if it wasn't Wilton Speight. Speight had challenges dealing with pressure at times last year, and the Michigan offensive line has been overhauled significantly, so if the Gators can disrupt the quarterback early then they could set themselves up for a strong day. If the Michigan O-line can establish itself, though - and though it has been changed it is also more athletic and better coached than it has been in years - then Speight will have time to set up and look to exploit a Florida secondary that faces changes and is not going to be a big strength early in the season. One of the most annoying storylines out there is that Michigan will be in trouble because they lost so many starters. While they lost more players to the draft than anyone, they still return a tremendous amount of talent, and much of that talent has played plenty even if they haven't technically started. Rashan Gary, for example, counts as a new starter, but the sophomore is already one of the most feared defensive linemen in the country and keys a Michigan defensive line that should be every bit as tough as last year despite big losses to the NFL. Don't make the lazy mistake of assuming that Michigan will be too raw to compete here. The game opened with Michigan favored by 3.5 on a neutral field, and it has since climbed to 4.5 . Just over 60 percent of bets have been on the Wolverines, so the movement is consistent with the action. The total sits at 43.5, with action relatively balanced at this point. Florida has won their last 27 season openers but has gone only 13-13-1 ATS over that time. Michigan is 6-2 both straight up and ATS in their last eight opening games. Florida is 1-7 ATS in their last eight against the Big Ten. The teams last met in the Citrus Bowl following the 2015 season, which was the first for both Jim Harbaugh and Jim McElwain with these programs. Michigan humiliated Florida, coming out on top 41-7. I'll admit to some bias here, but I don't see this game as being particularly close. Michigan's defensive line is outstanding and will make things rough for the Florida QB, who will already be facing a lack of options through the air. Michigan's offense is well rounded despite the changes and has some big play players - certainly more than Florida has on offense right now. It's not likely to be a high-scoring shootout, but in the end I expect Michigan to comfortably cover.